During this decade the work on the horseshoe path with its two stone and thatch shelters and other paths in the cycad amphitheatre and Dell was finally completed. The building of a Lecture Room for nature study classes (the current Lecture Hall), the first glass house (for the care of winter succulents) and an annexure to the Tea House took place towards the end of the decade. 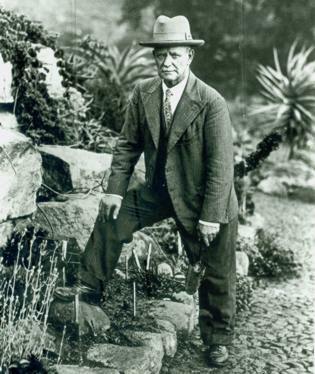 Two extensions to the succulent rock garden, later named after the curator Mr Joseph W Mathews who served as Kirstenbosch’s first curator from 1913 to 1936, were completed. 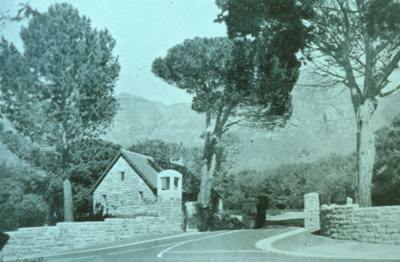 The main road to the Garden (Rhodes Avenue) was also widened and a new entrance was built with a bell tower designed by Gwelo Goodman, with a cottage inside the gate for the assistant curator in 1938-9. The bell was presented by Lady Phillips as a memorial to her husband Sir Lionel Phillips who had been instrumental in the founding of Kirstenbosch and had remained a generous supporter of Kirstenbosch. The parking area was under oaks in front of the Tea House in those days. A lone sweeper can be seen in the winter of 1930. 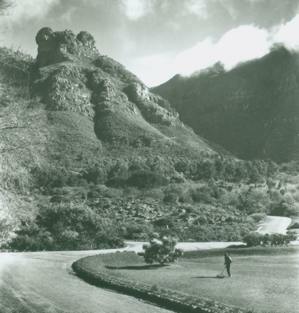 In 1938 Kirstenbosch celebrated its Silver Jubilee. General Jan Smuts addressed members of the Botanical Society, an official banquet was given by the Mayor, and various other celebrations took place. Nature study classes used the garden then as they do today. 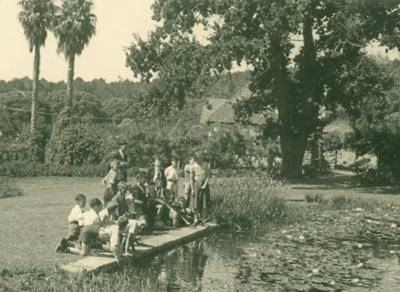 The image above shows the main pond and the house near it, which predated the garden and was only demolished in 1949. The oak tree is still there. Mowing the main lawn in those days was no easy task. The first motorised mower was only bought in the 1940s. The cultivated area of the garden was expanded and work was done on the new nursery, including sinking a 5 ft deep concrete wall in an attempt to exclude moles from the bulb beds. Funds were raised for the restoration of the Silver Tree Forest by selling a pine plantation and holding a performance of Midsummer Night’s dream in the garden in 1934. The Cape Times also started a fund for the purpose of preserving the silver trees. During this decade the Bolus Herbarium moved to the University of Cape Town and the Garden’s herbarium, later called the Compton Herbarium, came into being and occupied the building on the hill. The Journal of South African Botany also appeared for the first time in 1935.